The gender pay gap is a European problem. PES Women members list their best national practices in how to tackle wage inequality between women and men, and give some examples of their equal pay campaigns. The Swiss parliament is discussing measures at the moment, demanding all enterprises with more than 50 employees must let external entities do checks of their wage system every four years and must inform all employees about the results of the check. This will affect 54% of all employees in Switzerland and would give women hard evidence to fight wage discrimination. The figurehead for this fight is Simonetta Sommaruga, our social democratic minister for justice. More info here. Originally, Sommaruga planned even more measures, like a blacklist of companies that do not respect wage equality, but because the fight is very hard in the parliament, she had to adapt them. Politicians from the right are threatening to block the discussion. More info here (article in German). The national state only gives contracts to private companies that self-declare they have no wage inequality and does random checks of this. The Act to promote Transparency in Wage Structures (6 July 2017): 1st pillar – Individual disclosure right to request pay information for up to 14 million persons / 2nd pillar – Company-intern evaluations / 3rd pillar – Obligation to report on equality of pay. The law has been a compromise with the Conservatives which has to be strengthened. Here you can find more information about the law. This document offers an overview of the measures we have taken so far to fight wage inequality, and what still needs to be done (transparency is just one of them). Online toolbox for employers supporting the implementation of the Pay Transparency Law. Implementation of a minimum wage in 2014. Extension of childcare infrastructure (legal right to a child care place for children for children older than three in 1996 and for children from the age of one in 2013). Better reconciliation of work and family as well as supporting needy relatives (Parental Allowance introduced in 2007 and Parental Allowance Plus in 2015 offering further incentives for couples to equally distribute responsibilities and for an earlier return to work). Quota law for more women in leadership positions in 2015. Reform of caring professions in 2017. Action days like girls’ day/boys’ day. Campaigns together with ngo’s like Business Professional Women, the trade unions and the federal women’s council. ASF information leaflet on Equal Pay (click here). Post card (2017) of a regional ASF group (click here). In 2017 Lithuania adopted a new Labour code. For the enterprises employing more than 50 employees it is mandatory to prepare the gender plan, including gender pay gap decrease. SDP party’s president candidate Tuula Haatainen (left), the Chairman of Trade Union STTK Antti Palola, executive director of Social Democratic Women Merja-Hannele Vuohelainen and political assistant of Social Democratic Women Roosa Pöyhönen. 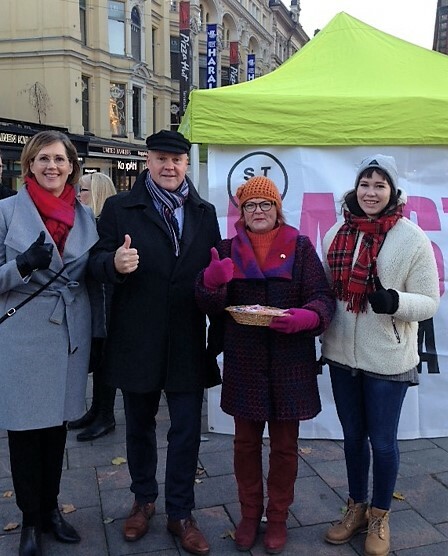 Co-operation with Nytkis (the coalition of Finnish Women’s Associations) and trade unions. Information campaign in Helsinki with candies, reflectors, badges etc. Information campaign on websites and social media. MPs have been raising awareness around equal pay in media.